It seemed like I’d all but exhausted the burger options around my job, especially those that only serve burgers during lunch. That is, until a few weeks ago when The Treemont announced that they would start a lunch service and that they would be adding a burger to that menu! 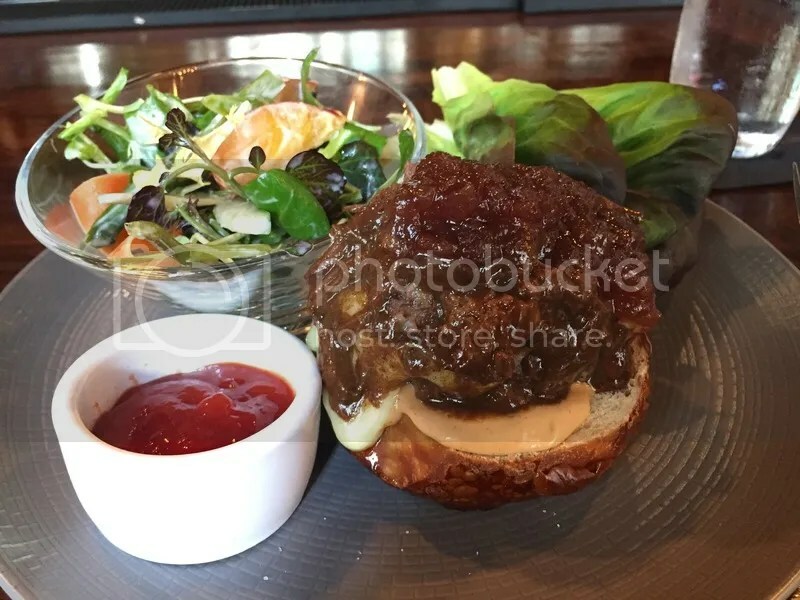 So I threw my soggy salad in the trash and headed over to check out the Treemont burger, topped with short rib, smoked onion jam & Comte cheese. The burger comes with your choice of a salad or potato skins; I felt guilty over my tossed packed lunch, so I chose the salad option. I wasn’t asked how I wanted the burger cooked, but it came out almost well done. Luckily, it was salvaged by the delicious short rib on top, which was tender and juicy. The cheese was thick and gooey. The onion jam gave the burger a nice, savory flavor without being too sweet. My favorite part might have been the bun; it had the flavor & consistency of a pretzel bun, but without the salt on top. It was well proportioned to the patty, although I did find myself with one final bite where there was only bun remaining. It was thick and helped to soak up all the runoff from the short rib, the jam, the cheese, and what appears to be some kind of aioli smeared on the bottom bun. If this bad boy had been cooked perfectly to medium temp, it might just have gotten an A! Posted in buns, burger, burgers, cheese, Comte, lunch, onion jam, short rib, The Treemont. Bookmark the permalink.